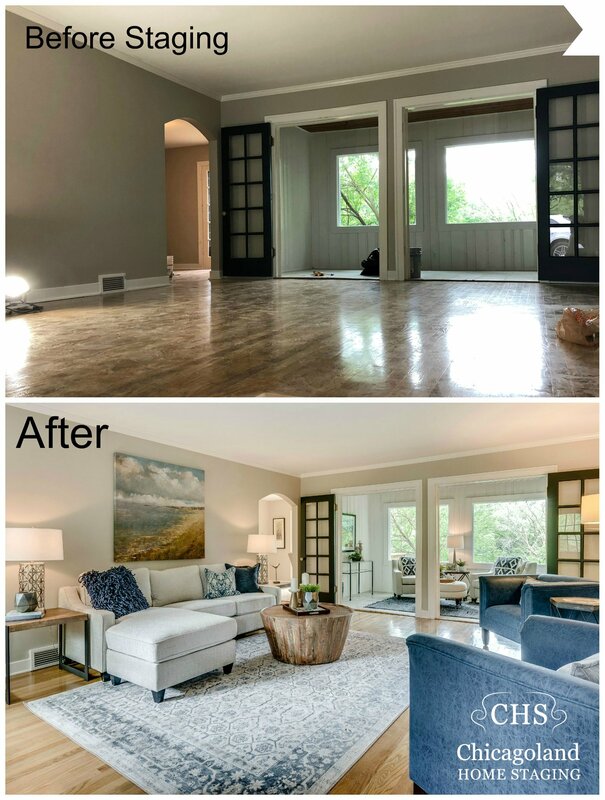 We recently had the opportunity to stage an affordable Burr Ridge Illinois home for our client, who needed an amazing home staging transformation to show off the property’s value. 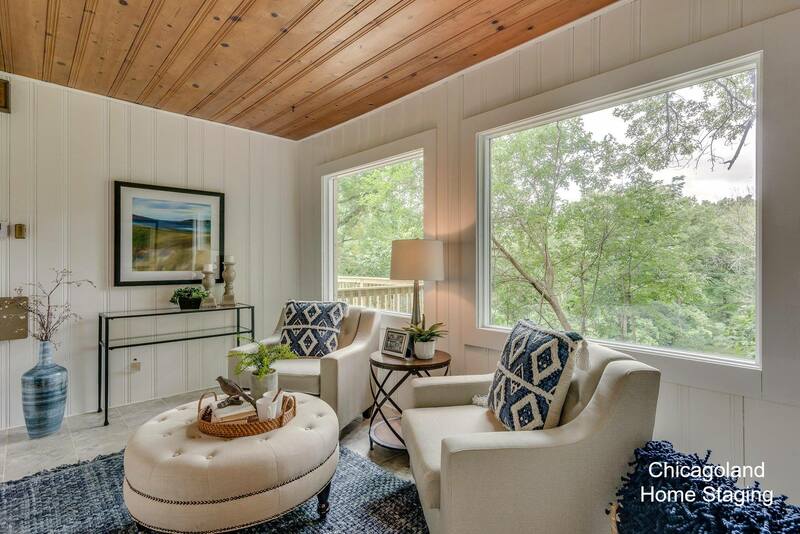 Here at Chicagoland Home Staging we were excited to highlight the positive features of the home, including it’s amazing views looking out over a valley of trees and fresh water creek. 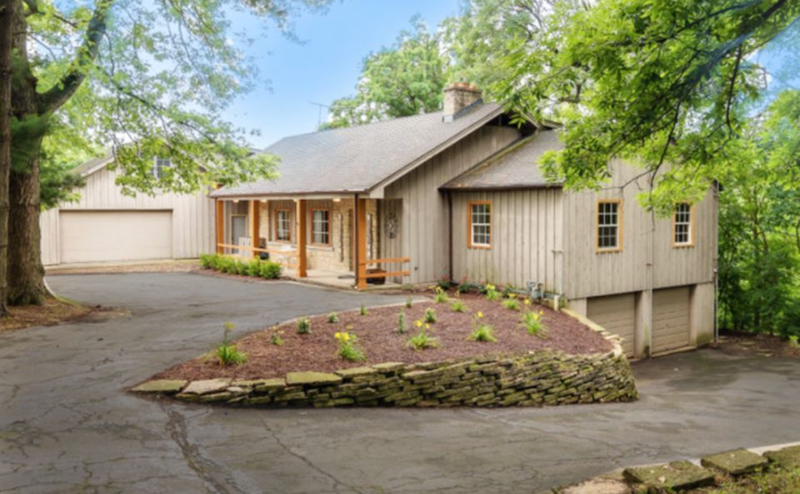 Take a look at the transformation above, this five-bedroom, 4-bath cottage style home had “great bones” to start with. 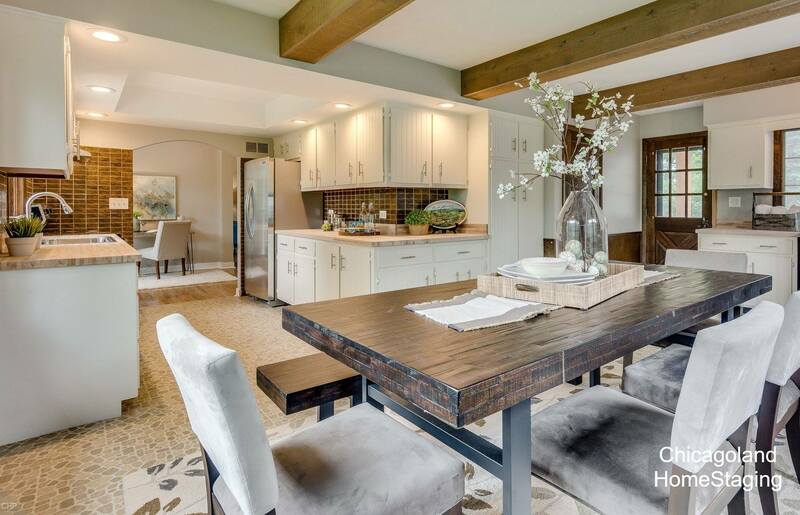 Our team at Chicagoland Home Staging wanted to strategically place furnishing inside the property to emphasize it’s space, organic style and picturesque views. Since this in an older property competing with new construction homes on the market, we recommended painting the walls an off white neutral. While the previous color was a neutral tone, it was a darker hue absorbing the property’s natural light and making the space appear smaller than it’s generous 2,300 square foot floor plan. Paint is a simple, affordable solution to freshen up the look of a space, and highlight it’s cottage charm like knotted wood ceiling in this sitting room. We mimicked the features of the property, like the picture windows and doorways, by creating a symmetrical furniture set up in the adjacent rooms. This type of placement embraces the set of two to achieve balance and instill a more traditional look. By using a traditional color, for instance navy blue, with the rental accessories our team produced one cohesive look throughout the property. From accent chairs to rugs we used this color mixing and matching different textures and pattern to add personality. Blue represents a color you’d find in nature and worked perfectly to bring the outside in. The hue also worked well with the crisp linen colors and organic wood tones found inside the property to create a welcoming farmhouse cottage feel. Now this home is ready to show buyer’s it’s true charm. 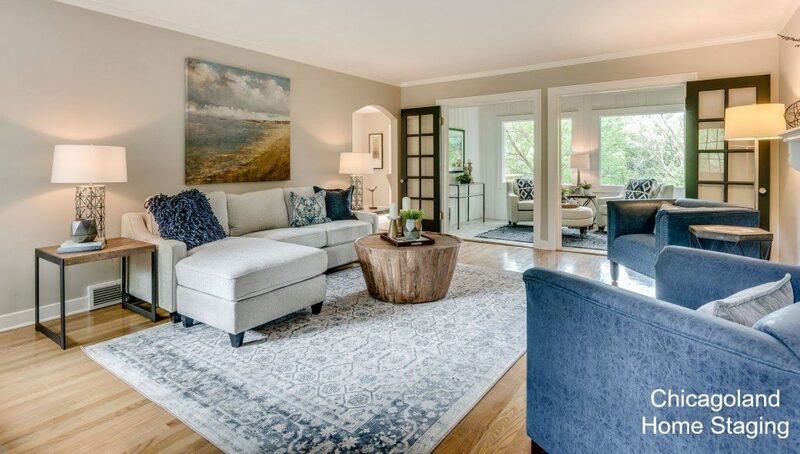 If you’re looking to add personality in your vacant Burr Ridge property feel free to contact us today for a quote and to learn more about our services.